Item # 314141 Stash Points: 795 (?) This is the number of points you get in The Zumiez Stash for purchasing this item. Stash points are redeemable for exclusive rewards only available to Zumiez Stash members. To redeem your points check out the rewards catalog on thestash.zumiez.com. Mix and match the Stone + Locket Pink Bunny and Shimmering 3 Pack Scrunchies to create unique looks every single day. 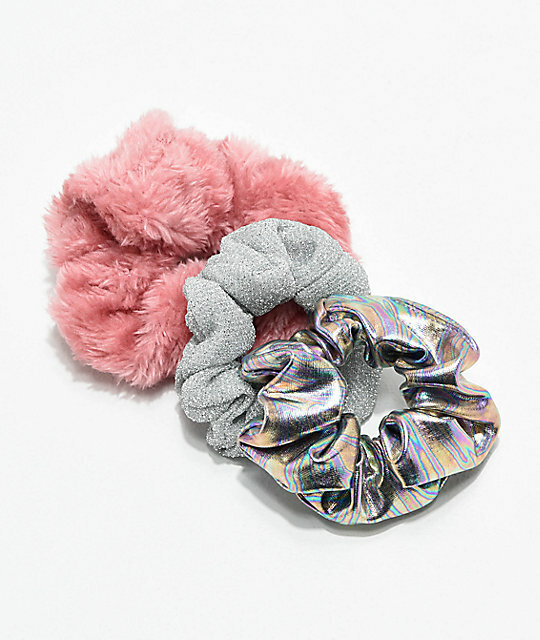 This accessory bundle includes one fluffy pink scrunchie, a silver metallic scrunchie and an illuminescent 80's-inspired scrunchie. Tie your hair up and garner attention to your signature streetwear style! Pink Bunny and Shimmering 3 Pack Scrunchies from Stone + Locket.